This set of Cyber Security Questions and Answers for Freshers focuses on “Security Protocols – 2”. 1. Authentication in PCT requires _____ keys. Explanation: For message encryption using PCT it requires two separate keys. Moreover, PCT has more options for data formats and security algorithms. Explanation: The latest standard version of TLS is version 1.2. Version 1.3 is still in the development stage. Explanation: Session Initiation Protocol is an important protocol used for starting, preserving and terminating any real time sessions over the internet. 4. In which of the following cases Session Initiation Protocol is not used? Explanation: Session Initiation Protocol is used as real-time session maintaining and is used voice, video as well as messaging applications for controlling multimedia communication sessions. Explanation: Secure Real-time Transport Protocol is a real-time multimedia delivery protocol with encryption for message integrity and authentication. It is used mostly in entertainment systems and streaming media and sites. Explanation: Encapsulating Secure Payload is a special type of protocol used for offering integrity, authentication, and confidentiality to network packets’ data in IPSec (Secure Internet Protocol). 7. ________ is the entity for issuing digital certificates. Explanation: Digital certificates are used for certifying the ownership of a public key and the entity who issue those certificates is the Certificate Authority. 8. IKE is abbreviated as Internet Key Exchange. Explanation: Internet Key Exchange is a security protocol used for setting up a security association in the Secure IP protocol. IKE = Key Management Protocol (KMP) + Security Association (SA). 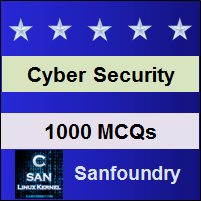 To practice all areas of Cyber Security for Freshers, here is complete set of 1000+ Multiple Choice Questions and Answers.